JQI theorists have created an ultracold- atom model for investigating properties of the Datta-Das transistor. 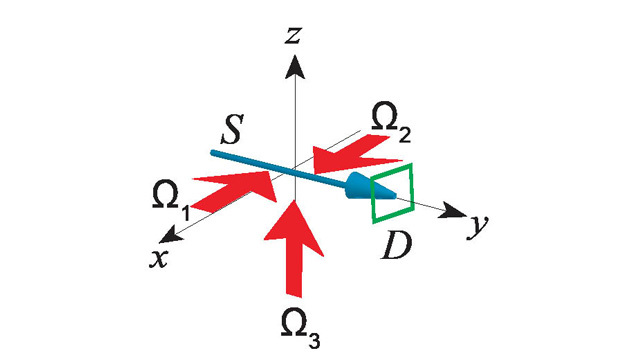 A ferromagnetic source (blue) emits electrons that are “spin-polarized” -- that is, they all have the same spin orientation.The electrons pass into a semiconductor gate region (green). If no voltage is applied to the gate, the electrons’ spins will be unchanged, and they will enter the ferromagnetic drain (blue), which acts as a filter, accepting only those electrons with a specific spin polarity. BOTTOM: When a voltage is applied to the gate, it causes the spins of the electrons to precess. They exit the gate with their spins rotated by an amount that varies with the gate voltage. Unless their spins match the polarity of the drain, they will be scattered away, reducing the output current. Atom beams as a model DDT. LEFT: A beam of atoms crosses an area in which three laser beam overlap. 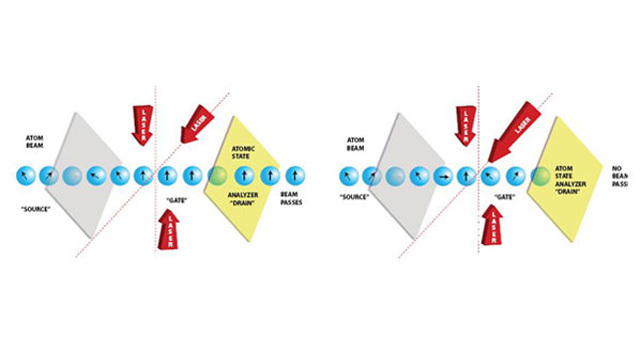 The first beam places each atom in the same excited state. As the atoms pass through the region where the second and third lasers cross, their states may or may not be altered. If no atomic states are changed, the entire beam passes through the analyser -- the equivalent of maximum current in the drain of a working DDT. RIGHT: By “tuning” (changing the relative strengths of) the lasers, the state of the atoms in the beam changes in a predictable way, altering the proportion of atoms in each of the three possible ground states, two of which are dark. The quantum difference between the two dark states corresponds to the difference between spin-up and spin-down electrons in a DDT, with the laser beams acting as the gate. Spin can be switched very fast, with low-power magnetic fields, and “spintronics” already lies at the core of today’s high-volume disk drive technology. But extending its alluring advantages to transistors has so far proven impossible. Twenty years ago, two Purdue University scientists proposed a highly promising design. To date, however, no one has been able to build a working model. There are simply too many possible sources of error, because the desired spin effects are extremely sensitive to very tiny imperfections in materials, stray fields and problems with electron injection, among other factors. Now, however, JQI Fellow Charles Clark and colleagues at NIST and at Vilnius University have devised a potential solution to the problem: creating a minutely controllable quantum analogue of the transistor action in a laboratory configuration -- in this case, an ultra-cold beam of atoms manipulated by a laser array. One of JQI’s central goals involves finding ways to simulate aspects of complex macroscopic systems, from the trillions of interacting atoms in condensed matter devices to the exotic and inaccessible physics of black holes and neutron stars, by using precision-tunable quantum models. 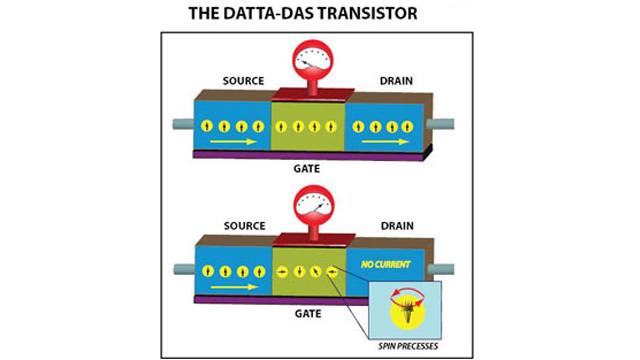 That approach is ideally suited to attacking the problem of the Datta-Das transistor (DDT, see illustration at right), named for the two Purdue physicists who theorized it in 1990. The group developed a theoretical simulation in which the DDT electrons would be represented by a “source” stream of ultracold atoms (neon and rubidium could work, among others) that pass through a space in which three crossed laser beams overlap. When the atoms are struck by the first laser beam, the beam puts all the atoms in the same quantum state -- equivalent to the identical spins of the source electrons in a DDT. But as the atoms encounter the other two laser beams in the “gate” area, they are shifted into different quantum states depending on the relative strengths of the beams. In the DDT scheme, electrons in the gate are affected by the voltage applied to the gate electrode. It produces a field that causes the electrons’ spins to precess -- a motion akin to what happens to a spinning top as it slows down and the force of gravity causes the spin axis to start to wobble in a circular motion. This effect arises from changes in each electron’s “spin-orbit coupling,” a phenomenon resulting from the fact that the electron experiences a constantly changing interaction between its intrinsic spin and the magnetic field it generates as it orbits. The field generated by the DDT’s gate voltage alters the spin-orbit dynamics, shifting each electron’s spin. Only those electrons with the same spin orientation as the drain can pass through. Thus the gate voltage controls the current, just as in an ordinary all-semiconductor transistor, theoretically permitting the device to be used for information processing. To model that action, the atomic-beam simulation uses laser light in place of the gate voltage, and the “ground” states (lowest energy conditions) of the atoms in place of spin orientation. When the first laser beam excites the atoms, they then “decay” (that is, shed the energy by emitting a photon) into one of three ground states. Only one of those states, however, has the right quantum properties to be re-excited by the laser frequencies available, and then reemit a photon. This is called a “bright” state, and can be disregarded for the experiment. The other two ground states cannot absorb (and thus re-emit) the specific frequencies of any of the laser beams in use, and so they are called “dark.” The two different dark states correspond to the two possibilities for electron spin orientation -- “up“ and “down” -- in the DDT. The proportion of atoms in each of the two dark states is a function of the relative intensity of the second (middle) laser beam, just as the proportion of DDT electrons in a particular spin state is a function of the device’s gate voltage. An atomic state analyzer at the end of the process detects which of the two dark states each atom is in, corresponding to the drain of a DDT, which filters out electrons with altered spin. Unlike the macroscopic DDT -- with its enormous number of atoms and myriad possible sources of error -- the atom-beam analogue offers the opportunity to study exceedingly small components of the device and to carefully control the behavior of the system, altering only one variable at a time. If eventually constructed, the atom-beam model should allow physicists to determine which specific factors are most critical to the performance of a DDT.